Top rated air purifier for sub-micron control of airborne contaminants in larger rooms. Excellent control of allergens such as pollen, dust mites, pet dander, and mold. Comprehensive protection from toxic chemicals, traffic exhaust and gases including formaldehyde and ammonia. Highly effective, low maintenance air cleaner for large and open concept living areas, small apartments and offices. Five year mechanical warranty for the machine and five year pro-rated guarantee for the true HEPA/carbon/zeolite filter provides the best long term value, performance and build quality in the air purification industry. This machine has 3 fan speed settings which draw in air from all four sides totalling over 5 square feet of intake area for exceptional air gathering capacity. 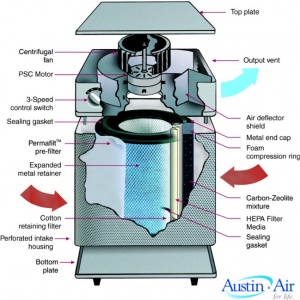 On the highest setting up to 250 cubic feet of air are cleaned every minute by passing through a multi stage process including approximately 15 pounds of Activated Carbon/Zeolite blend and 60 square feet of True Medical Grade HEPA. Cleaned air exits through a louvered upper outlet on one side of the housing. The HealthMate Filter consists of multiple layers of air filtration and purification material guaranteed for five years of exceptional performance. For chemically sensitive individuals this machine performs best in rooms up to 235 sq ft (22 sq metres). 360°air intake. Purified air exits through louvered vent on one side of upper deck. Large dams and hydroelectric projects disproportionately affect indigenous and tribal peoples and ethnic minorities.